Maybe I was tired, or just not in the right headspace, but unfortunately this week’s Draw & Sketch class was a bit of a bust for me, as my brain didn’t seem to want to cooperate with my hand! 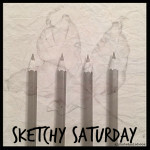 Still, I stuck it out to the end and – though it’s not pretty – will bravely share what (little) I accomplished for today’s Sketchy Saturday post. The session started as usual with a few minutes of free drawing to warm up and, similar to my experience with the first class, I blanked. 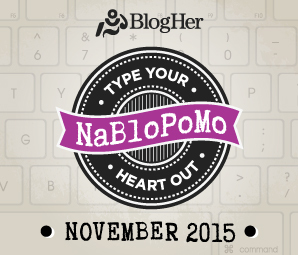 Well, maybe not blanked – but rather felt completely tired and uninspired (see above!) and couldn’t find it in me to do much more than twiddle my pencil and stare at the blank page in front of me. 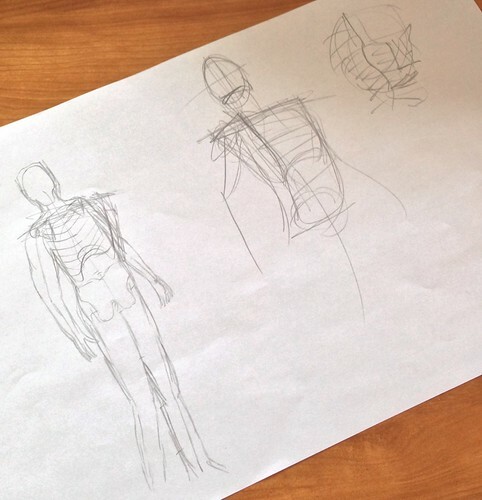 This week the class was given the choice of either learning how to draw a human skeleton as a followup to last week’s class on proportion, or changing direction and doing something cartoony. Since both lessons are going to be taught anyway, it didn’t really matter which we chose, but in the end decided to go with the first option for this week. 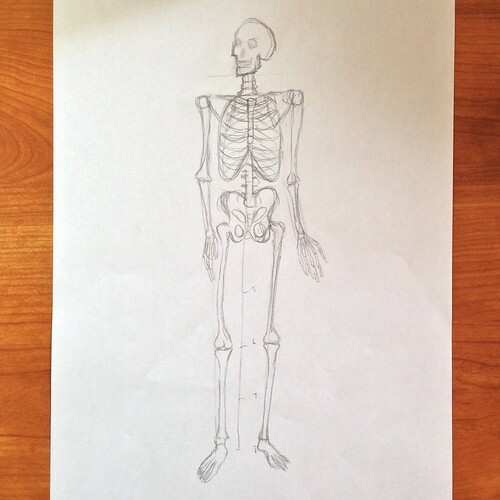 Our instructor gave us two handouts, the first being a diagram of a skeleton which we were encouraged to mark up with a headcount (see last week’s post for details). 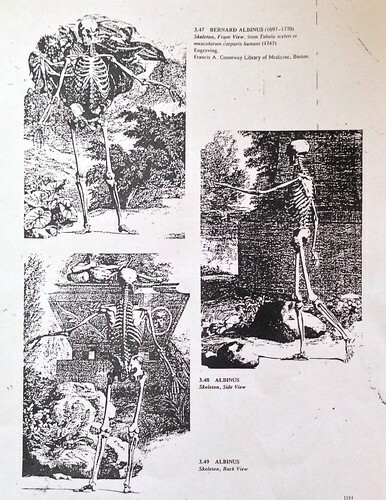 The second handout showed examples of front, back, and side views of a skeleton. 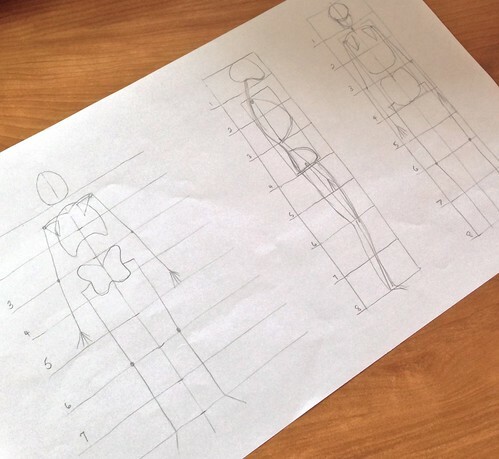 Our first task was to do simple stick-figure sketches of each view, drawing out headcount guidelines and keeping the various bones in proportion. Then we moved on to finding a magazine picture of a person and sketching them out using the skeletal proportions we’d just learned. In keeping with my mood of the evening I had a hard time even finding a picture that worked for me, and ended up sharing the one my friend chose. Wow, I struggled with this one! 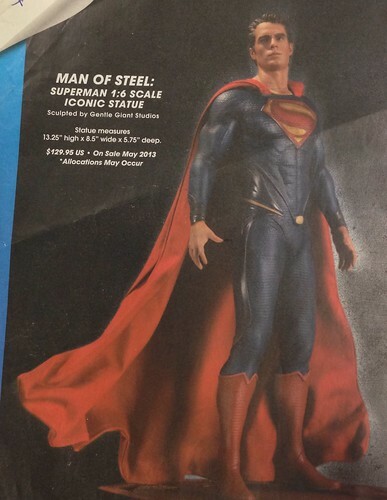 The wimpy (and very non-Superman-like) drawing on the left is mine, and the one beside it is my instructor’s quick example sketch of how I should be building up the figure to make it more bold. Several of my classmates ended up doing more than one drawing, but I lost patience with the process (and myself!) 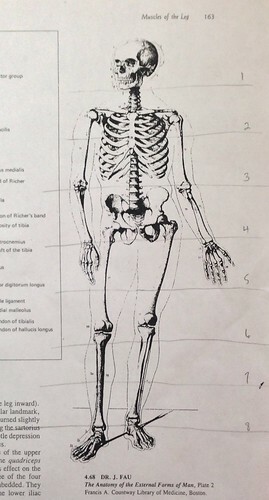 and amused myself for the remainder of the class by trying to copy the skeleton on the first handout. On the whole I was dissatisfied with tonight’s class – not in any way because of the instructor or the subject, but because of my own lack of energy that evening. Better luck next time, I hope! 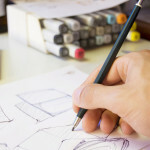 I think your drawings are fantastic! Far, far better than anything I can do! About all I’m capable of doing with a pencil is making out a shopping list. And I usually forget that at home! That’s very kind of you to say, Diane – thank you!